Two Koreas to hold summit, North ready for denuclearization talks: Seoul - Integration Through Media ....! SOUL, (AFP): North and South Korea will hold a historic summit in the Demilitarized Zone next month after Pyongyang expressed willingness to give up its nuclear weapons in exchange for security guarantees, South Korea’s national security adviser said Tuesday. The North is open to “frank” talks with the United States on denuclearization and would suspend missile and nuclear tests while dialogue was under way, Chung Eui-yong said after returning from a meeting in Pyongyang with leader Kim Jong Un. US President Donald Trump gave a cautious welcome to the announcement while Vice President Mike Pence said Washington would keep “maximum pressure” on Pyongyang until it takes concrete steps toward denuclearization. North Korea is subject to multiple rounds of UN Security Council sanctions over its atomic and ballistic missile programs, and has long insisted that its “treasured sword” is not up for negotiation. But it is willing to abandon the programs if its national security — and that of its leadership — is guaranteed, Chung said. That remains a high threshold — Pyongyang has considered itself at risk of invasion by the United States since the Korean War ended in a ceasefire in 1953, leaving the two technically still at war. But Chung said Kim is willing to discuss denuclearization with Washington — a crucial concession that could enable a dialogue. Washington has long insisted Pyongyang take concrete steps towards denuclearization as a precondition. “Whichever direction talks with North Korea go, we will be firm in our resolve,” Pence said. Tuesday’s developments are the latest steps in a rapid Olympics-driven rapprochement on the peninsula. They follow a year of high tensions during which Pyongyang carried out its most powerful nuclear test to date, along with launches of rockets capable of reaching the US mainland. But the Pyeongchang Winter Olympics in the South triggered an apparent transformation, with Kim sending his sister to the opening ceremony, sparking a flurry of cross-border trips as South Korean President Moon Jae-in tries to broker talks between Pyongyang and Washington. The North “made clear that there is no reason to own nuclear (weapons) if military threats towards the North are cleared and the safety of its regime is guaranteed,” Chung said. Pyongyang “expressed willingness to have frank dialogue with the US to discuss the denuclearization issue and to normalise North-US relations,” he added, and said there would be no provocations such as nuclear or ballistic missile tests while dialogue was under way. Previous negotiations have ultimately foundered, however. Six-party talks, grouping the two Koreas, Russia, China, Japan and the US, and offering the North security and economic benefits in exchange for denuclearization, broke down almost a decade ago. 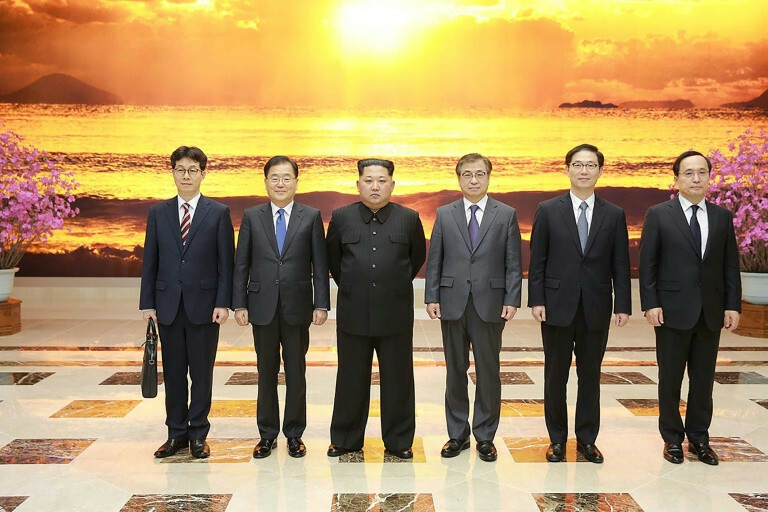 The trip came after the North’s leader sent his sister, Kim Yo Jong, to the Winter Games, the first visit to the South by a member of the North’s ruling dynasty since the end of the 1950-53 Korean War. Kim also invited Moon to a summit in Pyongyang but the South Korean leader said the “right conditions” were needed.